The creator of the Real-Food Diet, Laura Pensiero, is the owner of the Gigi Trattoria restaurant in Rhinebeck, New York. She also is a registered dietitian and former culinary coordinator at the Memorial Sloan Kettering Wellness and Prevention Center. The Oprah Magazine named Pensiero one of five “amazingly gifted and giving food professionals”. Her Real-Food Diet which is outlined in her book – Hudson Valley Mediterranean: The Gigi Good Food Cookbook -focuses on eating real food that is fresh and seasonal while avoiding foods that contain additives and preservatives. Pensiero acknowledges that many people are struggling with excess weight but she says that just telling people to eat healthier foods doesn’t work either. She believes that feeling satisfied and well nourished is critical for successful weight loss and in her opinion Mediterranean-style cooking offers the most enjoyable way to achieve this. 1. Start Small Changing everything all at once never works. 2. Go Local Source out products grown and made in your community, from honey, cheese, grass-fed meat, and pasture-raised eggs to lettuces and herbs. 3. Play the (green) market Visit your local farmers’ market and ask the farmers for advice on how to best prepare, serve, and store the foods they sell. 4. Branch out Try a fruit or vegetable that you didn’t think you liked when it’s at its peak. Chances are you may change your mind when you have the opportunity to sample it freshly picked and simply prepared. 5. Learn the story behind your food When you connect with the men and women who grow what you eat, it tastes much better. 6. Plant a garden – however small Watching a seed turn into a delicious ingredient gives you an appreciation for what it takes to grow great-quality food. Of utmost importance is to avoid making any drastic changes in your diet. If you eliminate the foods you love you will suffer unnecessarily and end up feeling deprived. Instead Pensiero suggests that you try putting more healthy food on your plate. She offers simple ways to achieve this goal such as adding a colorful vegetable to a familiar stew, starting dinner with a great salad or replacing mashed potatoes with a whole grain pilaf. A great deal of emphasis is placed on eating locally and seasonally. She says that locally raised food harvested at the peak of ripeness tastes better and the pleasure of eating will be increased. Fresh fruits and vegetables, nuts, yogurt, goat cheese, ricotta, eggs, chicken, grass-fed meat, whole wheat bread, rice, peanut butter, walnuts, almonds, honey. Look for more healthy meal ideas here. The Real Food Diet encourages dieters to increase lifestyle physical activities such as walking and gardening. The author says whatever movement you do, just make sure it is something you enjoy. 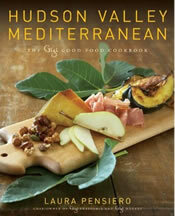 Hudson Valley Mediterranean: The Gigi Good Food Cookbook retails at $30. Recommends a variety of wholesome foods. Selecting local foods boosts nutrient intake and benefits the environment. Concentrates on improving health rather than just weight loss. Includes a wide variety of delicious recipes. Does not contain a structured meal plan. The Real Food Diet’s approach is best suited to dieters who regard enjoyment of food as an essential part of life and who like to cook. In addition to providing delicious recipes,the book also offers sensible advice, which will be very beneficial for those wishing to lose weight without undertaking a drastic dietary change.